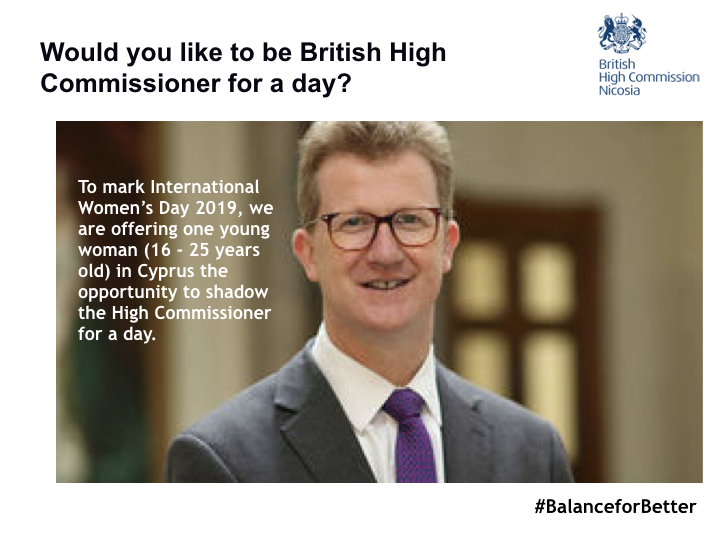 Would you like to be British High Commissioner for a day? APPLY NOW! International Women’s Day competition from British High Commission for young women in Cyprus aged 16-25 years old. Please write no more than 300 words what you would want to change in the world if you worked in diplomacy, or a specific issue you care about in your community. Please send your entries to ukincyprus@fco.gov.uk by Mon 25 March. The author of the best entry will win the chance to shadow High Commissioner Stephen Lillie for the day in the coming weeks.